IMPORTANT NOTE: If you have discs which are record or tape transfers that were done by other services and you want to have those recordings improved, WE CAN WORK WITH YOUR CD-Rs!! Visit our Testimonials page to view unedited feedback offered by dozens of our customers. WORLDWIDE MUSIC NETWORK is a highly reputable service with over 18 years of experience in studio quality audio restoration, music transfers and other media conversions. We possess the professional tools and expertise needed to fully restore and enhance audio recordings from vinyl records and tapes, and many other analog or digital sources. We are proud to say that the quality of our work is still arguably unsurpassed. Prepare Source Material - Vinyl records are carefully removed from their sleeves, then "deep cleaned" on a professional machine (VPI HR-17), using a specially formulated, non-destructive solution. The record is then vacuum dried to remove all remaining liquid or residue, buffed with a soft record cleaning pad, then placed on the turntable platter. The stylus is also cleaned to remove residue, which allows for the best possible transcription. Tape machines are subject to cleaning of the pinch rollers and tape heads, which are also demagnetized and aligned. This eliminates dropouts, and ensures maximum high frequency response during transfer. Record & Digitize - Tape machines, turntables and other analog playback devices are patched into a professional mixing console, to control signal input and output levels. Analog signals are run from the mixer into a professional stereo sound card, that converts the analog recording to a digital format. Digital devices (i.e. CD player w/digital output; DAT recorder; mp3 player; etc.) are connected to a corresponding digital input featured on the same sound card. This creates a full "digital-to-digital" transfer. We even have a $10,000 digital-to-digital device that can convert bit and sample rates. Amazing technology!! In any case, this is the part of the process where recordings are transfered from the original source to the computer. 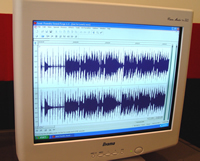 Save File - The digitized recording is stored on the computer hard drive, by saving it as a wave file in a professional audio software program. Once this has been completed, the recording is now in a controlled environment where it can be viewed on the monitor screen, and subjected to noise removal and other processes that will clean up and improve the sound quality of the original recording. Restore - Over the years we have devised an extremely effective multiple step method for removing "transient" noises such as clicks, pops and crackle, as well as other unwanted noise disturbances that detract from the listening experience. Pops and cracks are the most prominent annoyances found in vinyl records, and we start by first removing the largest and most noticeable. Then we gradually remove all others right down to the most minute. Once this has been completed, we determine whether there is any persistent background noise that needs to be removed (e.g. hiss, hum, etc.). If so, this noise is sampled and reduced to a level that will not affect the recording. Taking out too much background noise can remove all the ambience of the recording, and make it sound dull and lifeless. This is not a desired result, and we are capable of avoiding it. Tape hiss and other "broadband" noise that is frequently present in cassette and reel-to-reel tape recordings is reduced in the same manner. Equalize & Optimize - The last few steps in putting the finishing touches on a now very clean recording, are to improve the sound of the recording through digital equalization (if necessary), and to optimize the playback levels. We don't like to alter the sound of the original recording, unless we feel it is noticeably flat or thin sounding, or very bass heavy. The equalization process can give balance and increased presence to the recording. Optimization eliminates extreme variances in playback levels of the tracks on the disc, and maximizes playback volume without introducing clipping or distortion. This is a mastering process used in preparing commercial recordings for mass production. If you compare the sound of your finished disc to the original source, you'll be amazed at the difference! Index Tracks - All individual tracks are numerically marked at precise points, for accurate playback and programming (see our page on Track Indexing for more details). Burn Disc - Master CDs are burned at a slow speed (4x) to allow for the smoothest transfer of data. This is particularly important when streaming music and other audio information. We use Mitsui Gold and Mobile Fidelity Ultradisc CD-Rs and DVD-Rs, which are strictly manufactured for professional mastering. These discs are of much higher quality and have greater stability and shelf life (over 100 years!!) than any of the recordable media sold in stores. Case Inserts & Artwork - Worldwide Music Network offers a number of options regarding custom inserts for CD cases, including reproduction of album cover art, personal photos, etc., or will create professional looking standard inserts, all of which are sized to the exact dimensions of the cases. Visit our Artwork page for further details. You may also contact us if you have questions about any of our services.